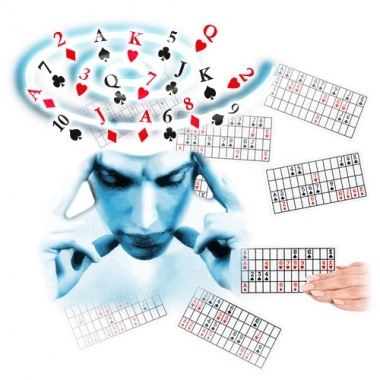 The performer asks a spectator to simply THINK of one of the 52 cards of a deck. He then places on the table eight transparent cards that have the pictures of random cards printed on them. The performer turns around, and asks the spectator to pick up only the cards that have on them the picture of the one he is thinking of. When the performer turns around he picks up the remaining cards from the table, and after a moment of concentration reveals the thought of card. - The effect can be immediately repeated. - A really extraordinary effect to bring always with you. - Very easy to do. The trick does not require any memory work or any calculations. - The transparent cards are made from plastic and measure cm 13,3 (5,2”) x 6,6 (2,6”).